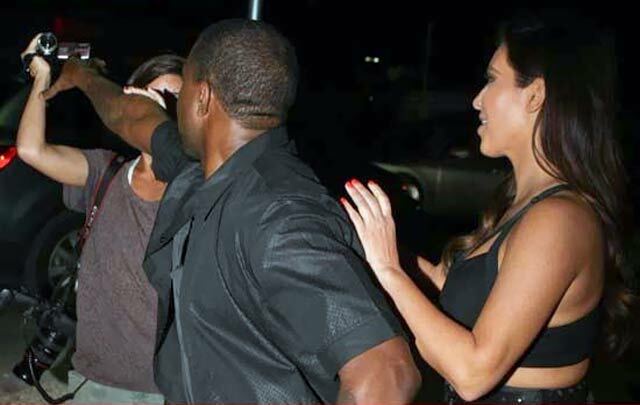 Kim Kardashian and Kanye West's Near Run-in with Reggie Bush: Yeezy Goes Nuts! Kim Kardashian and Kanye West’s Near Run-in with Reggie Bush: Yeezy Goes Nuts! Given that Kim Kardashian is spending so much time in Miami now, this was bound to happen: On Sunday night, Kim and her boyfriend, Kanye West, almost had a run-in with her ex, Reggie Bush. Reggie and his pregnant girlfriend were having dinner across the street from the restaurant where Kim and Kanye were dining. And yes, this set off a huge paparazzi frenzy, as everyone waited to see if the two couples would eventually meet up face to face. Yikes! And what was Kim Kardashian doing while her boyfriend was menacing the photographer? Apparently, she just stood there, “smiling during the entire confrontation.” But really, what else could Kim do? The whole situation was likely very tense, and Kanye was clearly angry. If Kim had appeared angry, the press would speculate that she was furious with Kanye for his actions, and/or still in love with Reggie Bush. No, Kim did the only thing she could do under the circumstances: keep her cool. Is Kanye West jealous of Kim Kardashian’s ex-boyfriend, Reggie Bush? It sure seems that way!